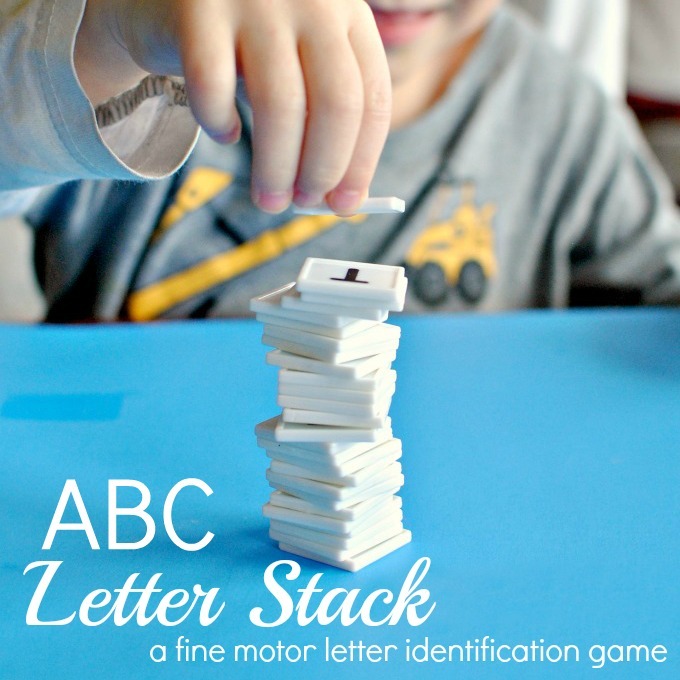 Here’s a simple letter identification game that is sure to be a tumbling success! Play again and again to practice letters and fine motor skills. One of the many advantages of being the daughter of a cabinet maker is my ongoing access to wood craft supplies. It’s like I have my own private manufacturer because my dad can not only create anything I ask, (literally anything; he’s so talented) but he’ll do it for his little girl. It really is too bad that I’m not more crafty. So, when I got a bright new idea for this letter identification game to play with my kiddos, I didn’t go to the craft store. I called up my dad and put in my order which he summoned from the scraps at his shop. My order was very specific, “Two hundred one inch square wooden tiles, 1/4 in thick, please.” (I could have even specified the kind of wood. He wouldn’t have batted an eye, but the kind of wood didn’t matter here). He replied, “Of course. How ’bout I cut you three hundred, instead? You can pick them up from the house this weekend.” And when I did I might have ignored my mom’s, “He’ll do anything for you but when I ask him…” (Maybe I should remind my dad of his ongoing honey-do list). And that is how my letter tiles and the ABC Letter Stack Game came to life! These are the same tiles I used for the letter-sound matching activity and I have used them for so many more fun literacy games . But if you aren’t the daughter of the cabinet maker with the same awesome perks, there are letter tiles available that will work great for this and other games as well! Disclaimer – After several years, and lots and lots of preschoolers, I finally replaced my wooden ones with the plastic ones you see in the updated photos. My dad couldn’t make me a new set, because, you know, he probably has a honey-do list ten miles long! 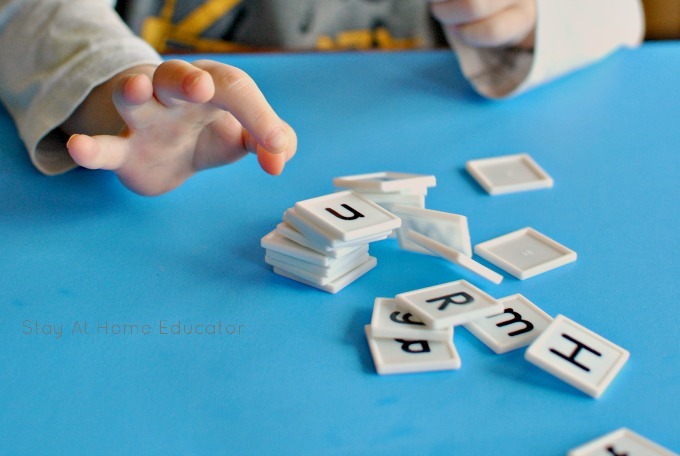 This activity is for building letter recognition skills. Before you begin, spill out the letter tiles on a tray , separating the letters that are unfamiliar. 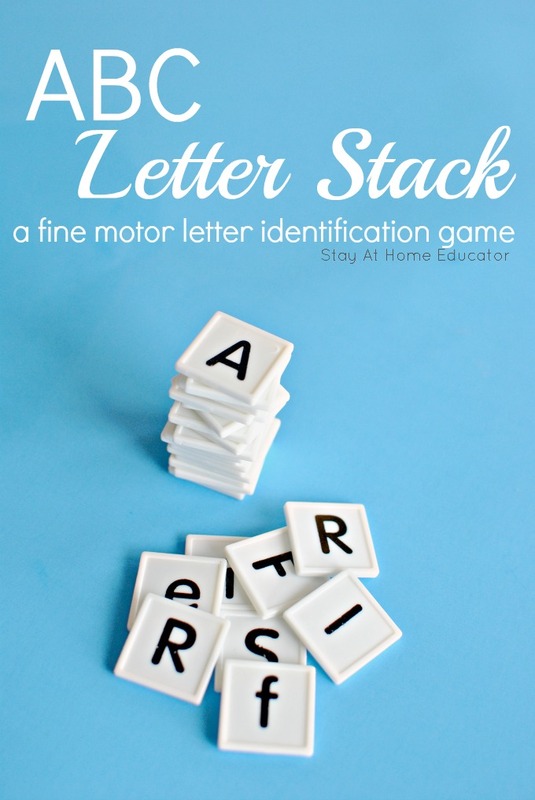 This game is best played to reinforce letters your child already knows, rather than for introducing new letters. 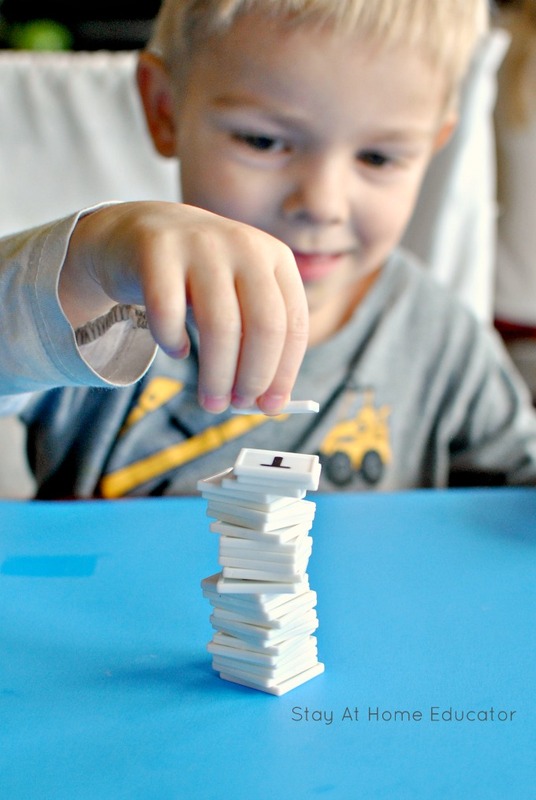 The object of the game is simple: take turns building a tower of letter tiles, keeping care that the tower doesn’t tumble down. Divide the tiles equally among the players. Several children can play at once, but this game is best with four or less. It makes an excellent literacy center, by the way. Select a player to go first. I like to make the selection by naming something silly, like whoever has a spotted cat or whoever has flown on an airplane. The first player draws a tile from his pile and names the letter, setting it out to begin his tower. Each player makes their own tower. Here’s the catch (and the real learning opportunity)! Before a new letter is added to the tower it must first be named by the player. If a letter tile is not identified correctly the player loses a turn and returns the letter tile back to his pile. I used both upper and lower case letters. Part of letter identification is discriminating between the cases and also between letters that look similar. But, again, as a letter identification game, this is best played with letters that are already familiar to the children. This game also makes an awesome fine motor activity. It takes the most careful coordination to stack the letter tiles and also encourages children to use a developing pincher grasp. Even my two-year-old had fun stacking the tiles. I named the letters as he stacked them and sometimes he would repeat the letters. The purpose of naming the letter with my toddler was to expose him to the alphabet. What he really liked the most was stacking the tiles on top of one another. The tower continues to grow until it tumbles over. Of course, the tumbling of the tower is everyone’s favorite part of the game! 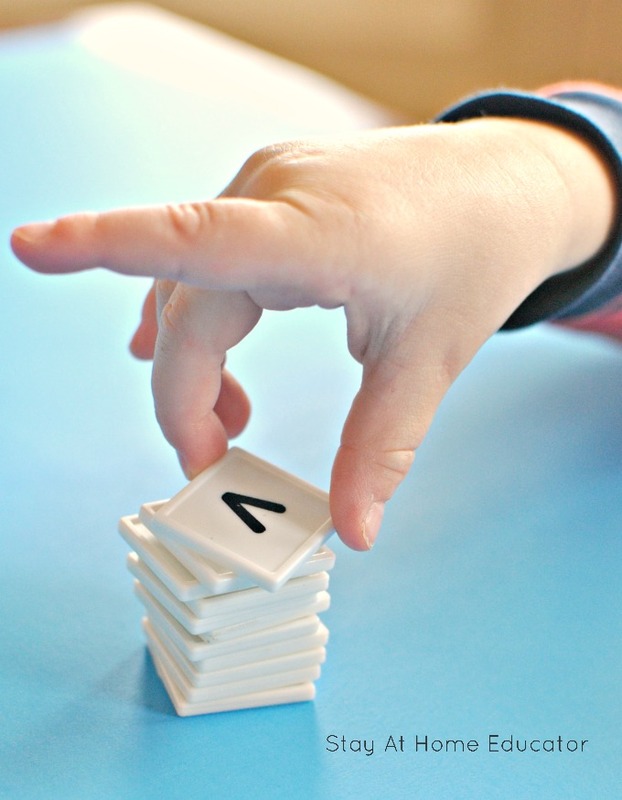 The notion of building a towers until they fall over motivates the children to play again and again, which means they are practicing letter naming skills again and again. And speaking of winning, the game ends when the first tower topples over . There are two ways to determine the winner of the game. Or, the winner can be determined by the tallest tower. The latter is best for older children who have really great motor control but choose the one that best fits your child. For my kids and my preschoolers, there was little to no competition in our game, so we ended it when the first tower fell. Thanks for sharing. This would be fun for older kiddos using sight words instead of letters. How fun! There are so many different things you can do with those! I love it! This is a great way to work on letter recognition. My son would love building a tower with tiles. What a fun game – I love that it can grow with your child! I am one of the co-hosts of the Weekly Kid’s Co-op Linky. I have chosen this post as one of my Top 3 and will be featuring it at as the intro to my linky tomorrow. You can have a look at http://www.theunlikelyhomeschool.com.